We all need a few easy recipes in our back pockets for impromptu parties or unexpected guests. Or, for that matter, snacks or unexpected cravings! 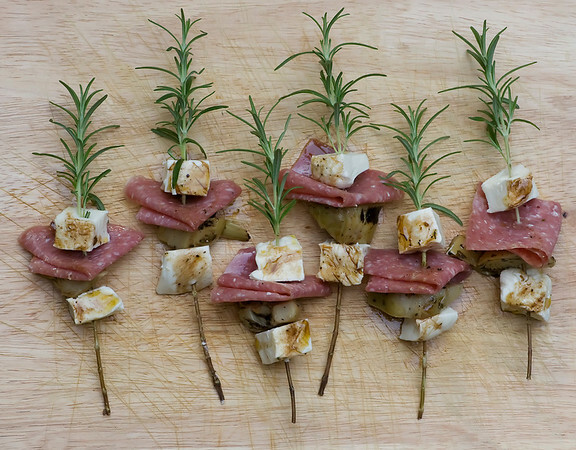 The newest addition to my list is these rosemary skewers I found at Framed. They are charming, easy and, I'm certain, quite tasty. And imagine the possibilities . . . . She uses mozzarella, salami and artichokes hearts. Yum. But I can also see grape tomatoes, mozzarella and basil. Or feta, artichokes and olives. Seriously, you are only limited by your imagination or the contents of your fridge if you are in pinch. I'm drooling onto my keyboard. Thanks. Ditto on the skewering with rosemary comment. That is a great idea. Wow this is really cool. Love it!!! Thank you for sharing it with us. I'm not a huge rosemary fan but that is a great idea for a party.